Children of the Swinton, gather in rejoicing! Ah, do you see the cartoon bluebirds? My Swinty senses are all atingle! 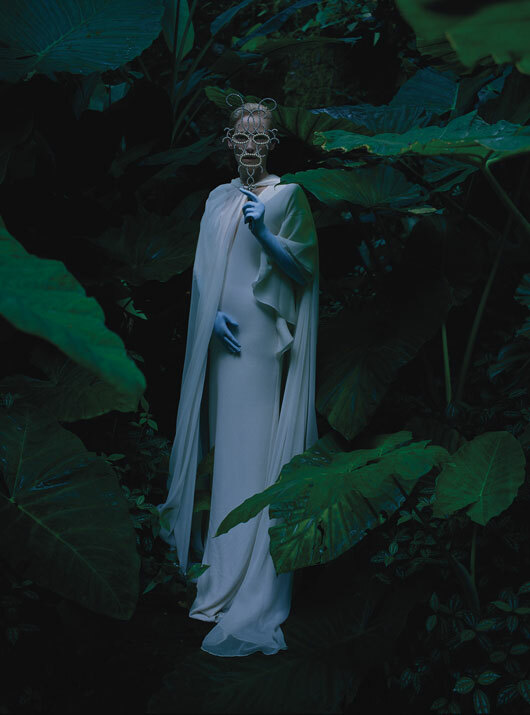 The docent has released our Tilda her plexiglass fortress of Swintitude and she is gracing the cover of W mag this month and in a photo shoot with some of our favorite Wearable Wednesday designers. Shall we peek? Oh yes, lets! 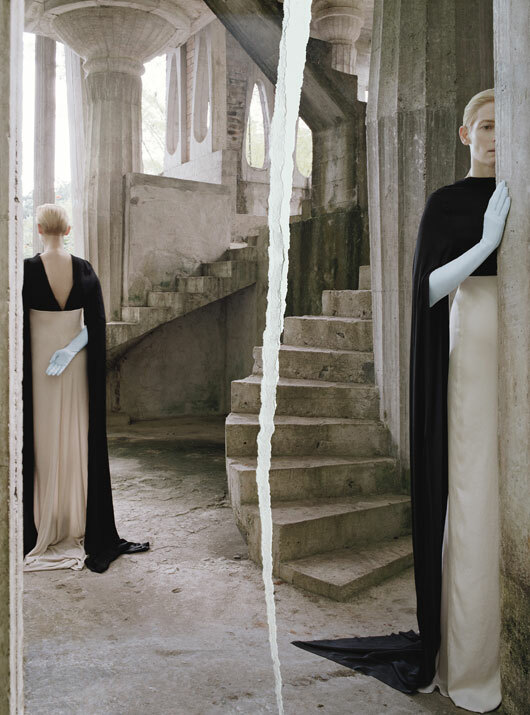 The spread is exceptionally Swinton- otherworldy, regal and a teeny bit ‘huh‘. As you’d expect. There are 2 pictures in the spread that I am not even sure she is really in- she’s that amazing! These are my favorites- they have a moody quality I just love. I can even see her antennae if I squint! Go see the rest here. Alright Tilda, you have dazzled us again, you may return to freeing the people of Planet Swintargon from the tyranny of Ambassador Zurg. photo credits: W Magazine. All images remain the property of their original owners. ya-huh. I want to make a huge costume like that one day and have really cool photos taken and plaster them all over my living room. I can think of no better plan. If its Swinton reality, just go with it!! I need to follow that! I knew _exactly_ where this was photographed before I clicked through to the website. The Edward James Surrealist gardens have been on my bucket list for AGES. Thanks! What beautiful images. And a back view of her hair too…not that I take pictures of her to the hairdresser with me, oh no. Oh, no- I wouldnt either! Wink, wink. 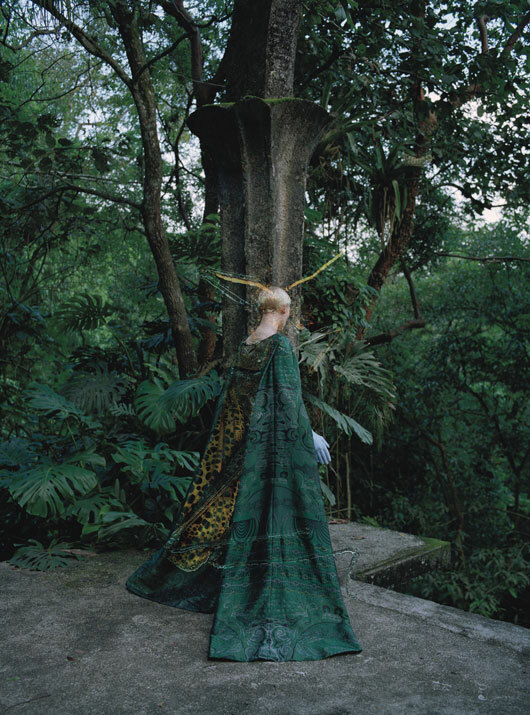 Only Tilda could dress like a big green moth and look fabulous regardless..
That Mary Katrantzou is perfect for her! We at Our Lady of Perpetual Swinton have a duty to spread her message, its a high calling. What a treat…I love her in the Haider Ackermann shirt and trousers. It really suits her, doesnt it? Thanks for the tip on W. They have, hands down, the best fashion spreads of any magazine when they show fashion. Which is not every month. I used to have a subscription, but most months W magazine just confuses me. I will get this month’s W from the newsstand. I know what you mean- its sporadically great, but not consistent. It’s as if she doesn’t belong on this planet but thank goodness she’s here! Like Bjork and Helena Bonham Carter. Exactly! im so glad the Crazy Trinity is here to dazzle us! Very ethereal. Are those antlers in the last pic?? Like a galactic gazelle, perhaps? ethereal elk; angelic antelope ? No no! It is moth antenae I tell you. But a very exotic moth! OK, your ability to detect this stuff is beginning to freak me out a wee bit – do you really work for NSA or CIA? I rely on the dachshunds scanning the Tildoppler 6000x (patent pending)! Those images are crazy cool. I love how, in the same breath they are bizarre and beautiful. I only wish my caterpillar eyebrows looked that artsy fartsy. She is so able to straddle beautiful and grotesque- amazing! Its almost a White Witch moment without the scary.